The NEW Leo Bridge Game is here! Leo Bridge > Bridge > The NEW Leo Bridge Game is here! More fun, more interesting and a new interface! 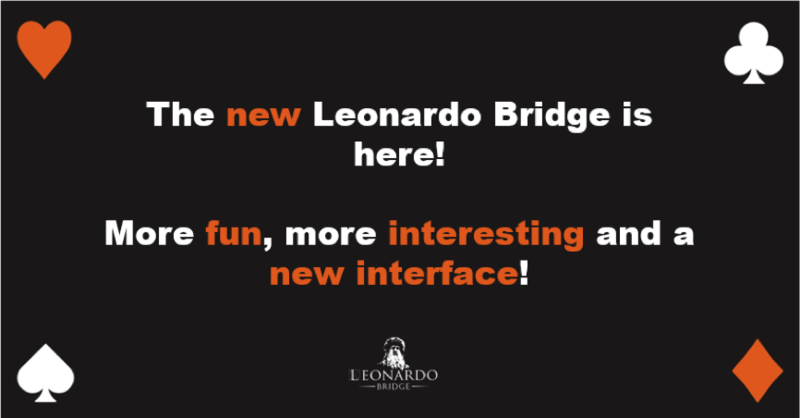 The new era for Leo Bridge Game is here, with many new features which make the game much more fun and interesting! Read below and get ready to experience all the new goodies, starting from 18/01/2017. Want to know more on which achievements we have created for you? Play Leo Bridge (Click Here) and you will soon find out! To make the play more interesting and competitive the concept of Bridge Matches and Bridge Coins is introduced. A Bridge Match is a set of 4 boards which correspond to 20 Bridge Coins. Each players starts every day with 80 Bridge Coins, which are enough for playing 4 Bridge Matches every day (i.e. 16 boards). So, from now on, each time you open a table you practically start a Bridge Match of 4 boards (therefore you don’t have the option to select number of boards when opening a table. It’s fixed) which corresponds to 20 Bridge Coins. As soon as the Bridge Match is completed, masterpoints, achievements and Bridge Coins are calculated for each player who participated to that Bridge Match. This way your profile is updated more frequently and you have a better view of your progress within the day. Then Leo is asking you whether you want to continue to play another Match (i.e. a new set of 4 boards) and so on. 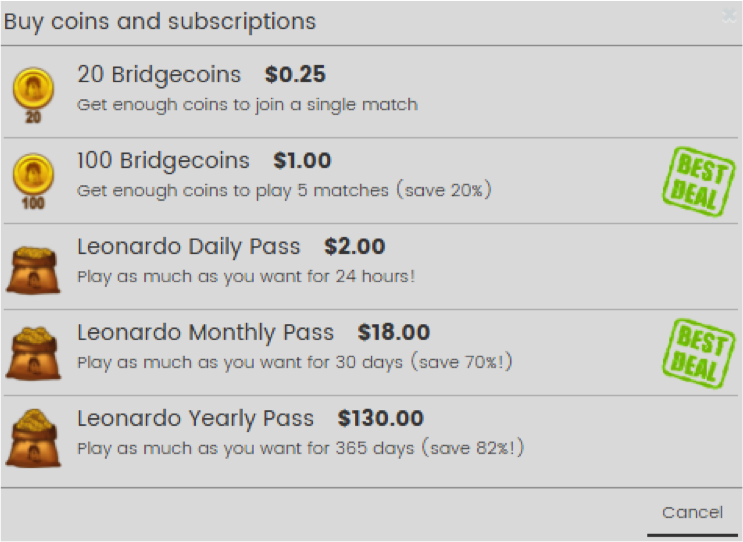 How can I earn Bridge Coins? Every time you win a Bridge Match, you earn 5 Bridge Coins. So, if you win 4 Matches you can play an extra Match, without needing to buy more Bridge Coins. Earned Bridge Coins are always available in your Wallet, while unconsumed daily bridge coins are not. Can I buy more Bridge Coins? Definitely yes! 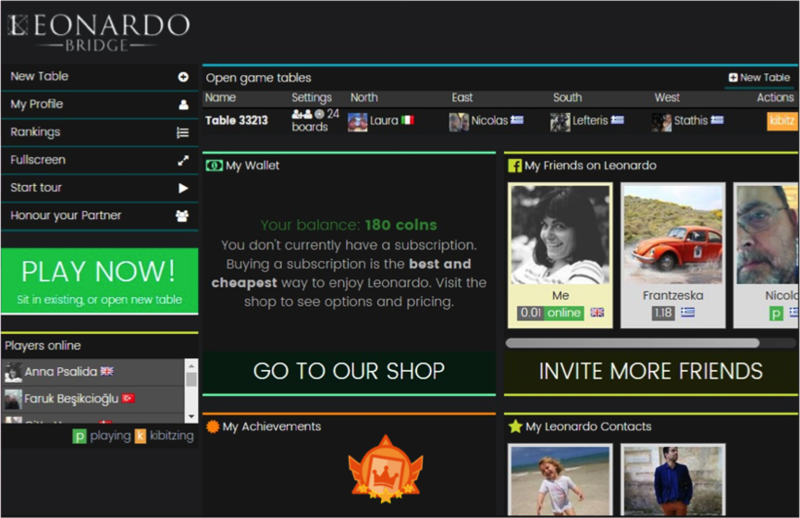 You can choose from a variety of options, by visiting Leo Shop in order for you to keep enjoying Leo Bridge and for us to being able to keep the Game alive! All these new features are complemented by a new interface, which follows current design trends, thus making your gaming experience even better.